Panoramica is one of the top ten golf courses in Spain, designed by Bernhard Langer. 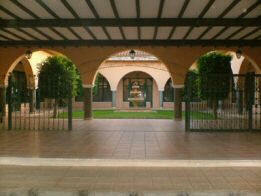 The club is located in Castellon, in a beautiful setting with lots of olive and carob trees. 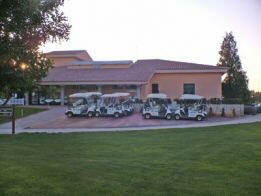 Panoramica Golf Club, is located in San Jorge town, on the North of Castellon and just at the frontier with Tarragona. Its stunning design was made out by Bernhard Langer (the only golf design he made in Spain) and it’s considered one of the best courses in Spain. We must point out its wide and wavy greens, the fairness of the fairways, a very easy to walk design and its five beautiful and big big lakes, located strategically in six different holes. Players can walk through its wide and quite plane fairways enjoying the most typical Mediterranean landscape. Panoramica Golf club course is a long, championship standard course, but the flat terrain, and lack of rough means that golfers of all abilities should be able to cope here. 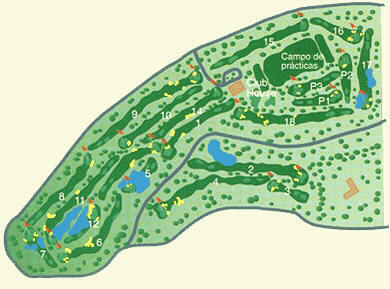 Panoramica Golf club is considered one of the best courses in Spain, . The golf course amounts to 80 hectares and its spectacular conditions make it possible for using it all the year. The design is a typical American one, consist of a combination between streets very closed and a rough made-up, which transforms the course an ideal one for high handicaps, also for players with an high level and specimen. The Panoramica Golf Club greens are based on large dimensions, seven holes defended by eight lakes, which makes for a varied game. The most representative holes of the course are hole number 5, a par 3 with 133 meters from yellow tee, with a green like an isle, and hole number 11 of 502 meters, whose left side, the last 200 meters before reaching the green, is a huge lake. Driving Range (300 x 150 metros). Pull trolleys and electric trolleys. Restaurant and bar in Club House. Lockers, club renting, club store, proshop. 3 holes par 3, next to the practice area. Click ABOVE for a list of Hotels,Guest Houses,Apartments and Villas in the Castellon de la Plana area in Spain for your golfing holiday. This was perhaps not the primary objective when Bernhard Langer designed the course, but his layout has over the years proven to be a very good test of golf. Set among old olive trees this beautiful course sweeps back and forth in gently rolling terrain, giving the player a great variety. The Ladies European Tour has played several tournaments here and it is often used by the Spanish Golf Federation for national competitions. Spain Info Panoramica Urb Marina, San Fulgencio, 03177, Alicante, Spain.